Located in the outside area of Birmingham Central Library, opposite Yardbird, on the top end of Broad St, it is a quiet yet robust restaurant. Friendly staff, animated décor, good big portions and the best thing of all the food is amazing. 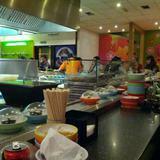 The best Japanese restaurant in Birmingham. It's well priced and also has promotions of a starter and main for ten pounds at quiet times of the year. The best thing with this restaurant, alongside the food, is the fact that the staff are not overbearing or pushing and allow you to stay as long as you want.